Sat, 10am to 5pm; Sun 10am to 4pm Adm. $6, children 10 and under free 3,000-6,000 annual attendance! Two day event includes educational exhibits, an awards banquet, a hospitality mixer, educational seminars, and a large auction of milk bottles and other dairy memorabilia. Attendees must register. For details on what's included in registration fees as well as how to join the NAMBC, please see the website: www.milkbottlecollectors.com. Fri. Early buyer 1 - 5pm, $5; Sat 9am - 3pm, Free Adm.
9am to 2pm. Free set up for all! Free coffee, donuts and pizza for all participants. Bring your own tables! Rain or shine! On the historic early 19th century glass factory grounds, including Exhibits / Tours. 9am to 1pm, early buyers 8am, $15. Adm. $4. 9am to 3pm Adm. $3, no early buyers. The Spring Antiques & Bottle Show, presented by the Batsto Citizens Committee, Inc.
9am to 3pm, FREE Adm.
Free Walk-in Appraisals. Onsite live auction. Show Address: Seven Feathers Casino Resort, 146 Chief Miwaleta Ln. Canyonville, OR 15-Exit 99. A 28-acre resort offering 15,000+ sq. ft of Glass and Porcelain Insulators, Hardware, Signs, LR balls, Battery Jars & Rests, Lamps, Bottles, Jars, Telephones, Table-top Collectibles and much more! 175+ Dealer & Display tables. 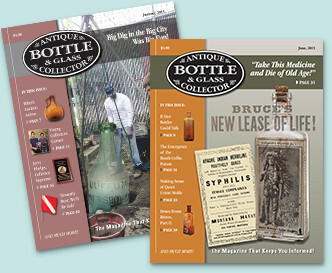 Outdoor Antiques and Collectibles including two huge bottle tents! Over 2,000 dealers and vendors. 9am to 3pm; Early Bird 8am $10 Free Adm! Free set up for all! Free coffee, donuts and pizza for participants. Bring your own tables! 9am to 2pm. Adm $3 for adults, children 16 and under free.